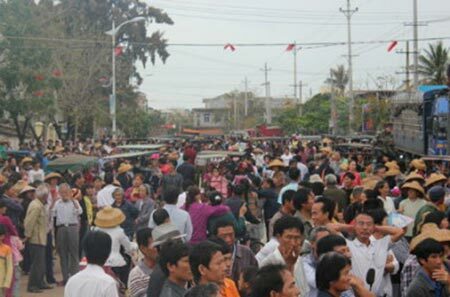 About 20,000 local residents from Yinggehai, a town in Ledong Li autonomous county in southern China’s Hainan province have protested the construction of a power plant by China Guodian, a state-run power producer, according to an article from the Hong Kong-based Metro International. According to local residents, there are also those supporting the construction of the plant, but most of them are government officials. A resident told a reporter from Hong Kong’s Oriental Daily that the reason they took to the streets was out of concern for the environment and their livelihoods. About 8,000 people in Yinggehai rely on fishing and aquaculture to make their living and townspeople fear the power plant would have an adverse negative effect on the local environment. One protester said waste emissions from the power plant would cause air pollution. They said they had already been demonstrating for a month. According to the demonstrators, some of the students at the local schools were forced to sign their name to support the construction of the power plan and were not allowed to go home if they refused to sign. Senior high school students were told they could not take the standard university entrance exams if they opposed the construction of the plant. The local residents said they are resolved to continue their protest until the authorities back down.